This strategic site has held some sort of fortified structure since Gallic tribes roved the area. Scaurus Aurelius, who founded a Roman colony here, was the ancient patriarch of the notable French family: the Scorailles. Records record that this family’s castle was conquered by Pepin and his son Charlemagne in 767. In 1000, the Scorailles family built a second castle nearby, and a village was established. In 1095, Guy and Raoul de Scorailles left for the Holy Land on the First Crusade. 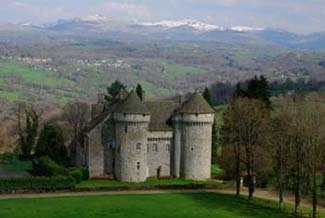 By the 15th century, Louis de Scorailles decided to build a third castle (the one we see today) to replace the old one that had declined because of the ongoing war with England. This castle was called La Vigne. In 1745 the castle’s only heiress, Anne-Charlotte, married and brought the property as a dowry to one Bertrand de Humières. It is said that philosoph Jean-Jacques Rousseau spent three months at La Vigne. Although the castle escaped damaged during the French Revolution, the structure fell into neglect until restored in the 20th century. A wonderful castle accommodation! The incredibly hospitable proprietors go out of their way to make your visit to their family home the most special part of your vacation. Be sure to ask about Bruno du Fayet de la Tour’s miniature car collection. His museum has some 3500 cars! If you want to tour the castle and not stay, there is a small charge of five euros. This helps offset the cost of maintaining the castle. Ally is approximately 48 km north of Aurillac. From route D-922, follow the signs to Ally. Bruno and Anne du Fayet de la Tour have created a delightful bed and breakfast inn, located in the tranquil Limousin countryside. As soon as you arrive, you’ll be personally welcomed and shown to one of four guest rooms. Choose the intriguing “Troubadours” room, and you’ll find a grand Louis XIII, four-poster bed, stained-glass windows, and a coffered ceiling. The “Louis XV” room features a working fireplace and a silk-draped bed. The “Rose ” room has the best view. Medieval touches abound throughout the castle—from the grand stone staircase to the wall murals dating from the 15th and 16th centuries. An excellent dinner of regional specialties is served in the grand dining room. Proprietor Bruno du Fayet de la Tour is a descendant of the ancient Scollieres family.